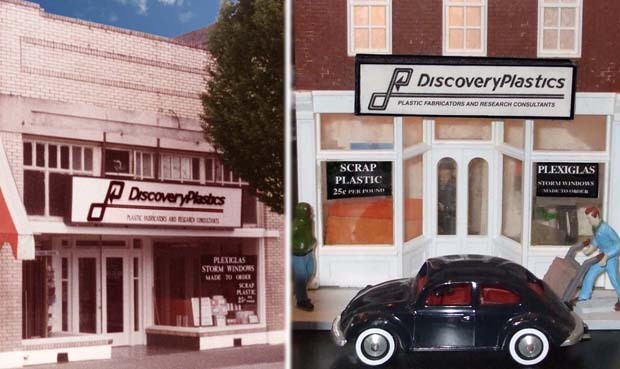 The real Discovery Plastics (circa 1978) is at left; Joe Sherlock's 1:48 scale recreation on his O-gauge train layout is at right. 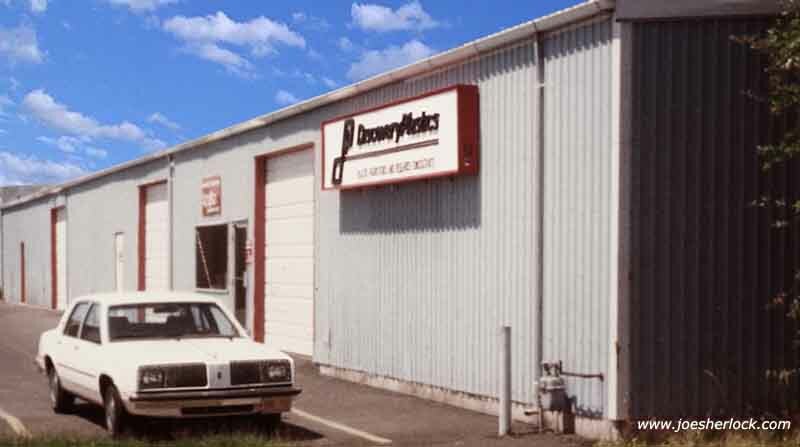 Discovery Plastics, Inc. debuted in 1973 as a small fabricator of various plastic items, mostly industrial parts, sign sub-assemblies and scientific instrument components. In late 1976, it was purchased by John Koegler, who soon brought in Joe Sherlock as partner. (The two had met when they worked together in the Plastics Division of Rohm & Haas Co.) When John purchased the company, it came with one employee. Joe became an investor in late 1977 and a working full-partner in mid-1978. Discovery Plastics' original home was a small 2,000 square foot store-front shop in downtown Corvallis, Oregon. "We can make almost anything out of plastic" was the company's unfocused motto. Discovery had the technical ability to construct various objects utilizing plastic as the base material, but sales were low, costs were poorly-documented and profits were non-existent. Technical skills alone - each of the two owners was a graduate Mechanical Engineer with more than a decade of plastics experience - wouldn't guarantee success. Even though many of Discovery's design solutions were innovative - one even won a national award, profits remained elusive in the early years. After working for large Fortune 500 firms, Sherlock and Koegler had to adjust to the realities of working in a very small business with limited time and resources. Sherlock later wrote, "When we stopped working so hard in the business, that gave us more time to work on the business. We now had the spare time to set up cost control systems, to evaluate employees, to fire the ones who made most of the mistakes (except, of course, ourselves), and to praise and reward the good ones. We had time to make a business plan, to set goals, and take actions. We not only wrote a business plan, we stuck to it, too. We now had time to pull our business plan out of the file and act on it. And to look for new markets with improved sales and profit potential." In 1978, the company purchased a simple Plasti-Vac (PVI) semi-automatic vacuum forming machine and a vertical acrylic sheet oven to expand its fabrication capabilities. And its market reach. Discovery Plastics' new vertical oven was used to heat precut acrylic sheets which were free-blown into domes, hemispheres and skylight shapes on DP's home-made forming press. 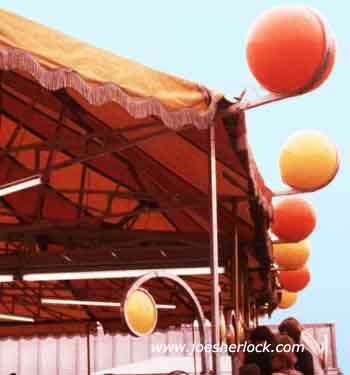 One of Discovery's early customers was Eyerly Aircraft, an amusement ride manufacturer for whom the firm custom produced translucent orange and yellow Plexiglas hemispheres, which were later assembled into light fixtures for the ride. The customer was very demanding. After many frustrating months, DP finally started pushing back. After looking at costs, Discovery Plastics raised prices 46% and stopped offering prepaid delivery. DP also stated that manufacturing lead times would double unless the customer was willing to pay for the special color plastic in advance, so that Discovery could pre-order and stock it without financial risk. After much noise, fury and threats to leave, the customer realized that DP was far superior than its previous supplier and agreed to the new terms. Discovery had created a profitable account from a former nemesis and learned a good lesson. 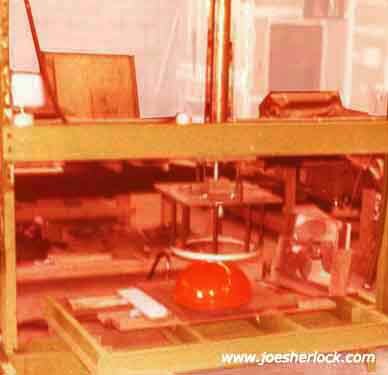 In 1979, cost-control programs were established to reliably predict and control the profitability of manufactured items, such as those yellow and orange hemispheres. The company began to make a profit. Real-world cost data was fed back into an improved job quotation system. Every job was monitored. If a project didn't produce enough profit, prices were requoted before a repeat order would be accepted. "If you make a profit on every job you do, you'll make a profit at the end of every month" became the firm's new motto. On a cold, foggy late-Fall Oregon morning in 1978, Discovery Plastics' plastic vacuum-forming machine was delivered. It had traveled cross-country from the manufacturer in North Carolina and was the company's first major equipment investment. Within a month, it was generating cash, producing electronics cases. One of DP's earliest customers for custom vacuum-formed components was a start-up firm, Flir Systems. This manufacturer of infared devices is now a publicly-traded S&P 500 company with annual sales exceeding $1 billion. A vacuum-formed white ABS, two-piece circuit board protector was manufactured for Nel Tech, a maker of home security systems. Discovery Plastics designed the product and owned the tooling, producing hundreds of thousands of parts for Nel Tech over several years beginning in early 1979. In 1981, Discovery secured an order from Purdy Brush Co. for plastic tote bins. Used internally to transport brush blocks, they replaced heavy, splintery wood boxes. Discovery Plastics came up with the ribbed bin design and specified/obtained the recycled off-white ABS plastic which provided durability but kept costs down. That's Joe Sherlock's 10 year-old daughter holding a finished bin. Buoyed by the success of the Hewlett Packard project, Discovery began to promote its capabilities in plastic displays to larger firms with a regional or national presence. The result - a better marketing focus and increased sales. 1980 turned out to be the company's best year for vacuum formed products as well, although machine utilization never exceeded 50%. It was eventually decided that there were greener plastic pastures elsewhere (i.e. - more profitable markets) and the PVI vacuum forming equipment was sold. 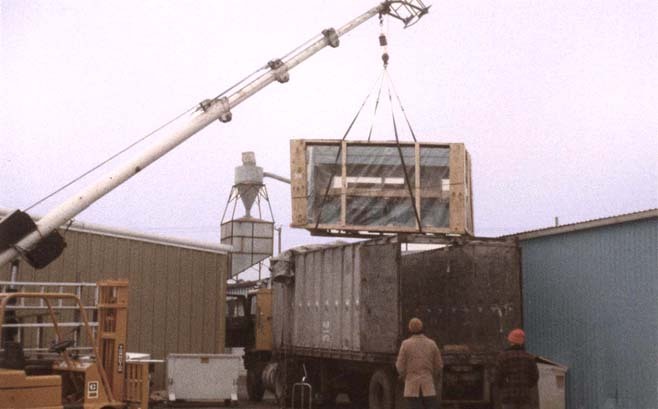 Acrylic sheet sales put an additional $10,000 in the company's coffers in May, 1980. This was impressive, since Discovery had only been appointed as an Acrylite distributor two months before. In recession year 1981, sales of sheet, rod and tube represented 47% of the firm's overall revenues and (because it was fast-turnover business) brought needed a much-needed flow of cash into Discovery's coffers. 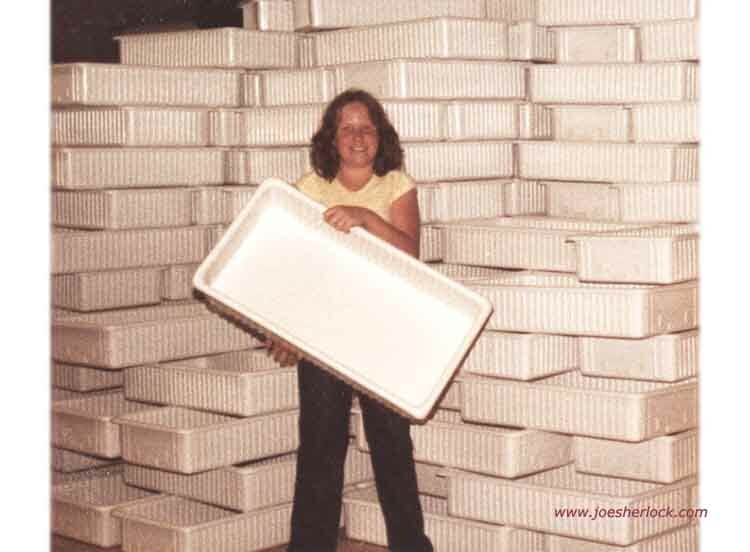 Even though the growing display fixture market would eventually dwarf the plastic sheet resale business, Discovery Plastics remained an enthusiastic distributor of Acrylite acrylic sheet and other plastic dimensional goods during Joe's & John's ownership of the firm. Despite the worsening economy, Discovery's overall sales for fiscal 1980 were up by 70%. It didn't come easily; Joe Sherlock spent a lot of time on the road that year and passed many evenings in budget motel rooms putting together quotations for prospective customers. By 1981, ever-increasing sales ran the company out of floor space, requiring a move to a 5,000 square-foot space on the north end of town. By 1983, the firm's drive for expansion would cause it to occupy 11,000 feet of that same building. In 1982, a simple black-and-white catalog was printed with line drawings of transparent acrylic displays and store fixtures. These were ready-made items for those customers who needed displays immediately and couldn't wait for a custom design to be manufactured. The company quickly bolstered its line of stock, ready-to-purchase items. Over the next seven years, the brochure size increased from four pages to 32 as Discovery's offerings multiplied. DP used its new literature as well as a special marketing program, 'Trade Show In A Box', to boost sales. Soon Discovery was printing and giving away over 100,000 catalog copies annually, primarily to store fixture distributors who got the brochures into the hands of their prospective customers. The most profitable items in the DP catalog were always featured prominently to encourage sales. The acrylic display business is very competitive but, by combining smart targeted marketing, tested promotions and exceptional service, the company grew rapidly and prospered. Discovery's stock display line included transparent acrylic cubes as well as clear display risers. And hemispheric domes. 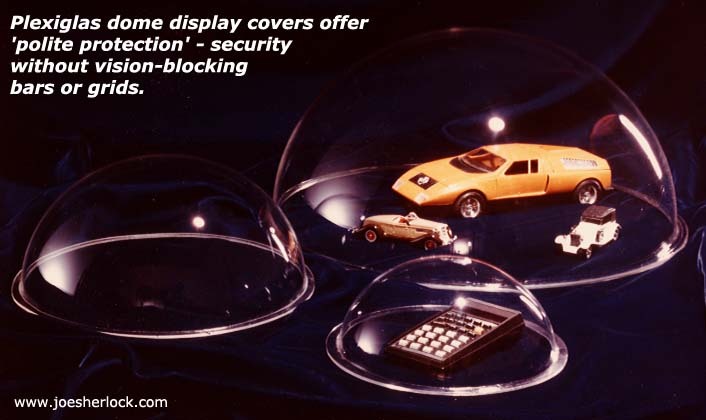 While not big sellers, these acrylic domes provided the product line with some distinctiveness, setting Discovery Plastics apart from its competitors. This led to increased overall sales of DP's catalog display products.